In the fourth part of Jade Jaunting, it's 1987 and the She-Hulk has just rejoined the Avengers. 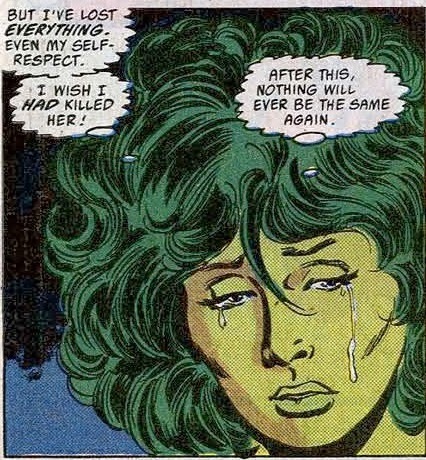 Unfortunately for the emerald amazon, this time would be nothing like her salad days among Earth's mightiest. Shulkie found herself getting put through the wringer constantly, suffering one humiliating fate after the other. If the cover of your first issue back on the job has you getting pulped by a fish man wearing a hot pink miniskirt... and Doctor Druid is your backup...Worry. 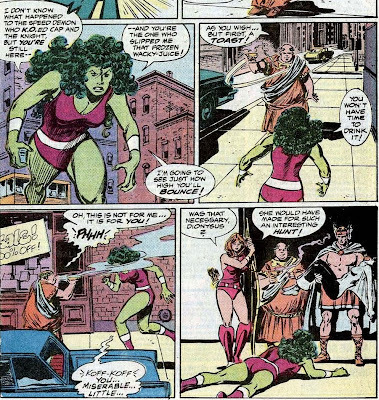 She-Hulk returned to active duty in Avengers # 278, which would prove to be the latter days of Roger Stern's classic run on the book. 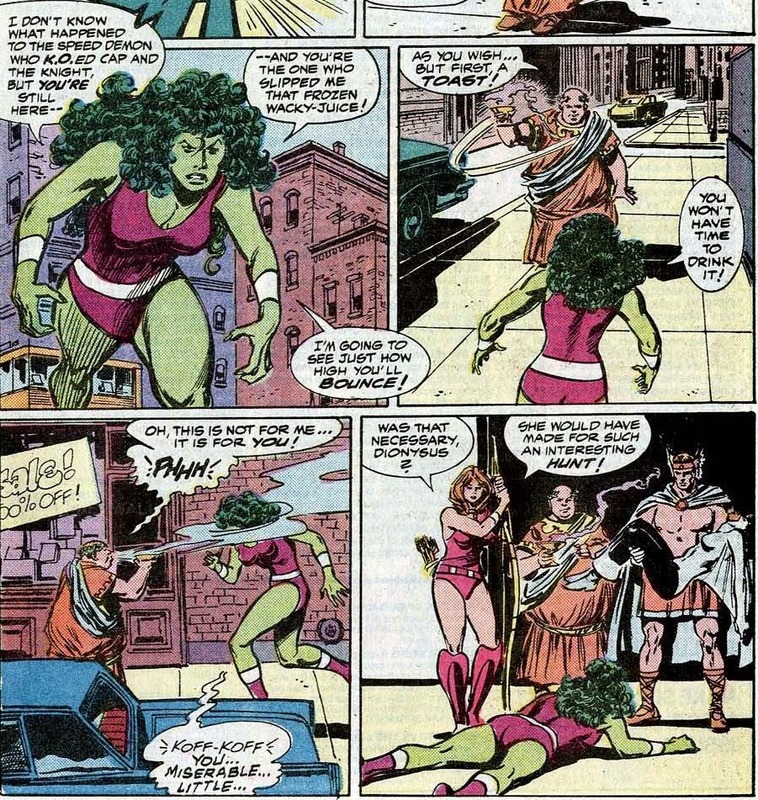 In the wake of the Masters of Evil invading and wrecking Avengers Mansion, She-Hulk rejoined to help out. 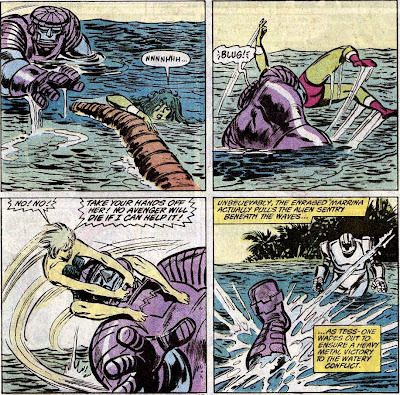 Her presence and raw strength were much needed, because Namor the Sub-Mariner had gone AWOL and the Masters had left quintessential strongman Hercules in a coma. However, Shulkie proved quite ineffectual against Tyrak. The augmented Atlantean warrior had come to Hydrobase, hoping to find the Sub-Mariner on the floating artificial island. To his surprise, he learned it doubled as the Avengers's temporary headquarters. That didn't stop him from slapping She-Hulk around until Dr. Druid and a severly concussioned Black Knight rescued her. "Now... do we have any nominations for chairman?" "Just a darned minute, Thor!" "I enjoy a good gag as much as anyone! But watch your step... you might not like my sense of humor!" Much like Hawkeye used to needle her in the early days, Shulkie was now being taunted by Druid, who used his mental powers to toy with her. The Black Knight was right, no good would come of this. As if being humiliated by a middle aged, balding mentalist in embarrassingly skimpy orange swimwear wasn't enough... #280 saw Zeus ordering his children to Earth to capture the Avengers. The Olympian All Father believed the team was responsible for Hercules' injuries. Guess which member of the Greek pantheon had the goods to bring down She-Hulk... Would it be Ares, the relentless god of war? Sturdy Hephaestus? Swift Hermes? No? Maybe noble Pallas Athena then? That's right, She-Hulk was beaten by none other than god of wine ánd parttime Don Rickles impersonator Dionysus. 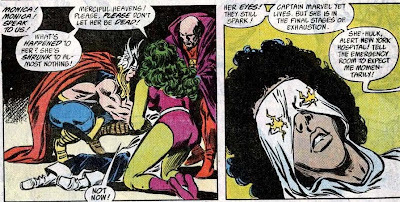 He initially mind controlled her with some magical cherry icecream, which caused her to attack the Avengers. And just as she was ready for some payback, Dyonisus took her out by blowing the vapors of a roofied drink in her face. 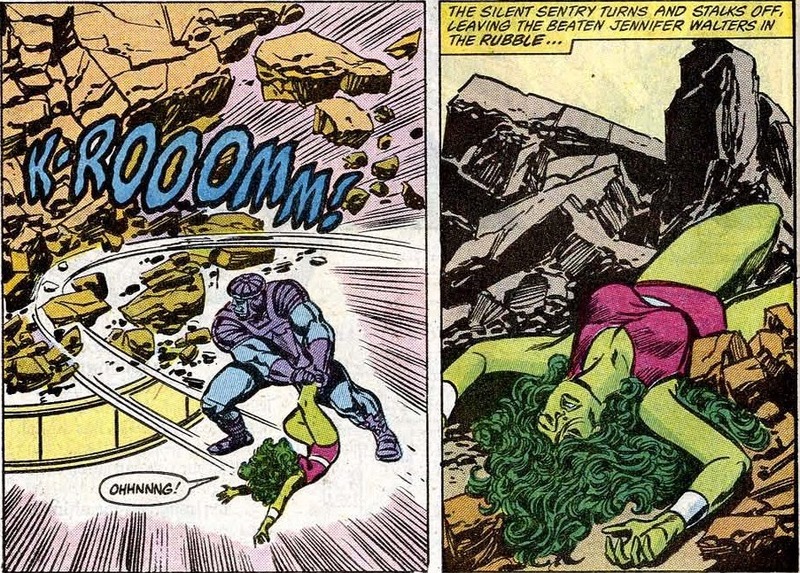 Once she came to, She-Hulk found herself chained up in Hades along with the other Avengers, pending their trial. And got knocked out within seconds. 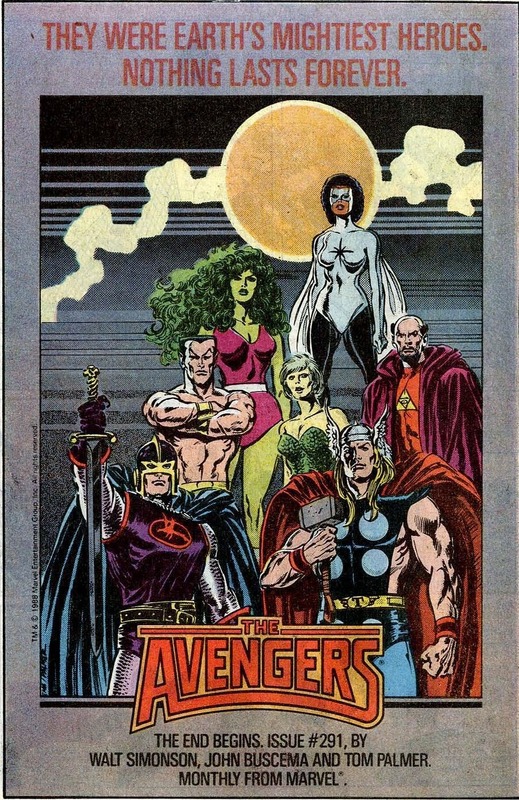 Avengers # 285 was the final issue Roger Stern wrote, he saw the team home and then quit after refusing to comply to demands by Marvel editiorial he changed his plans for the book. 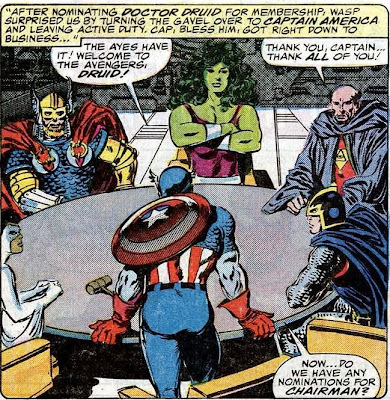 The powers that were had decided the team would be better served with Captain America in charge. Stern was ordered to start writing his beloved Captain Marvel as increasingly incompetent, providing the other Cap with a valid reason to take over. Sticking to his guns, Stern departed for DC, leaving Ralph Macchio to script the next arc over his plots. 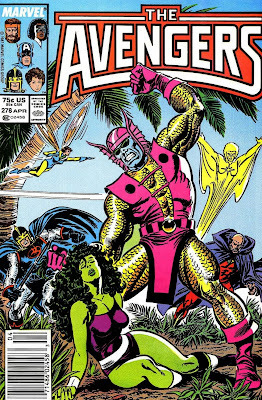 This resulted in Avengers # 286 - 290, an actually enjoyable storyline that saw the Super Adaptoid gather a small army of robots he dubbed Heavy Metal to harass the Avengers. "Mmm-MMMM! Look at those shoulders! 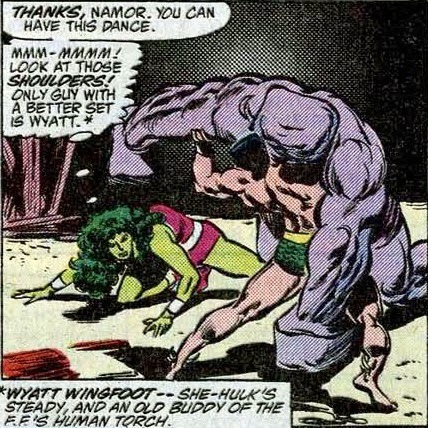 Only guy with a better set is Wyatt"
Unlike his predecessor, Macchio actually remembered She-Hulk was still involved with Wyatt Wingfoot... But he inexplicably came up with a minor storyline that saw her actively lust after Namor at every turn. While not too unthinkable, it did come out of left field, to say the least. 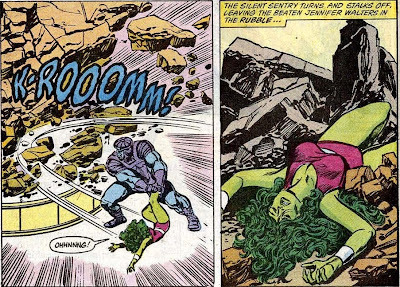 Thanks to Marrina, She-Hulk survived and even managed to score something resembling a win when she pushed the approaching Tess-One off the floating island, consigning him to the deep. 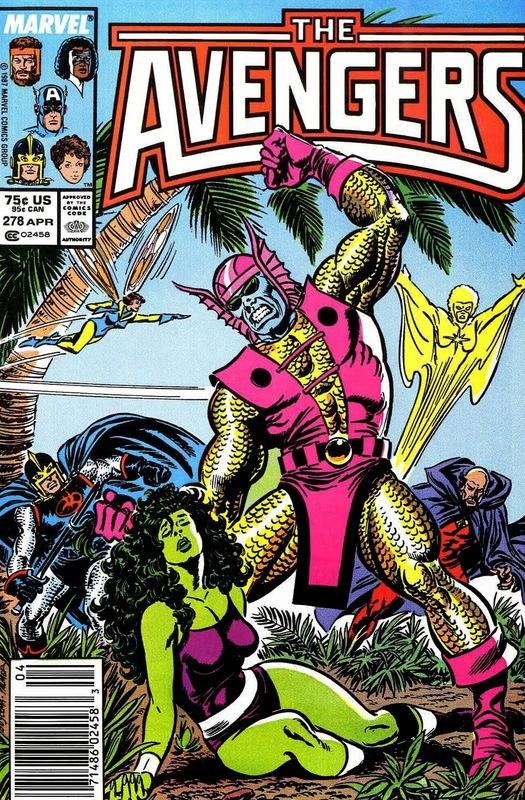 Eventually, the Heavy Metal arc ended in #290, with the Super Adaptoid defeating himself after Captain America (as the Captain) dared the villain to adapt death. Guess what? He died. ... Yeah, you can just tell this won't end well. Which is a bit of a shame. I remember hating what followed as a kid, because of the genuine affection I felt for this line up. While they were by no means the most powerful grouping ever assembled, they were a diverse, colorful bunch with a great power set. In fact, I was most likely the world's biggest Doctor Druid fan, long before my own hairline receded faster than Captain Marvel's credibility under Walter Simonson. Here we have C.M. 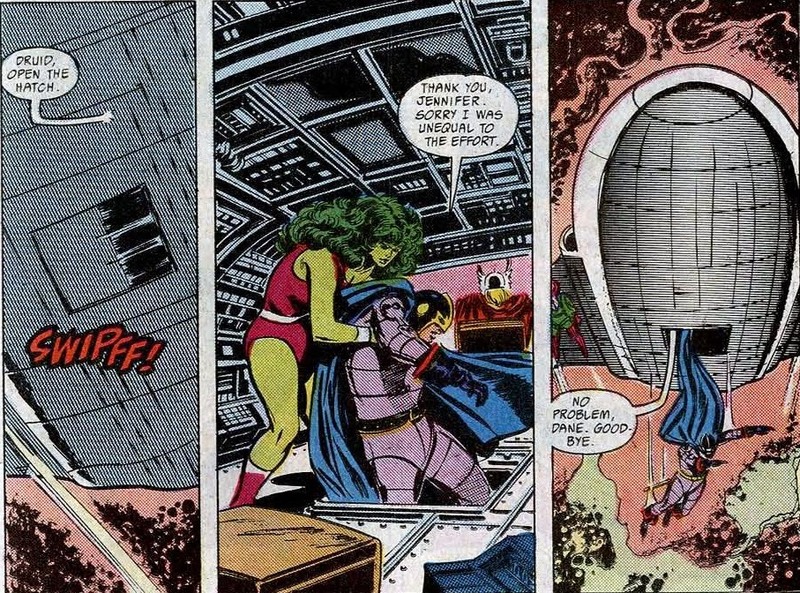 in the opening pages of #291 'helping' She-Hulk and the Black Knight clean up the mess left by Heavy Metal. "Why don't you go play in the traffic!" Walter wasted very little time tearing the team apart. First, he had Avengers associate Marrina go crazy. She reverted to a savage state, based on the fact she was actually hatched from a millennia old egg of Plodex origin. These aliens conquerors were able to shapeshift into whatever form they deemed most likely to assure them dominance over the indigenous population... And with the Earth being 70 percent water, Marrina mutated into a giant, ferocious sea serpent that threatened the seven seas. "Captain Marvel yet lives. But she is in the final stages of exhaustion." Yeah, you read that right: in yet another boneheaded move, Captain Marvel became electricity and ended up dispersing her form across the entire ocean. It took all her will power to regain human form, which left Monica in no shape to lead the team. A new chairman needed to be elected. 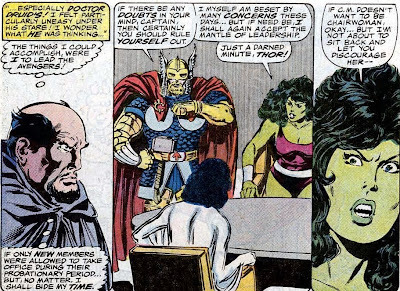 While Thor seemed the obvious choice, the ambitious Dr. Druid used his mental powers to nudge everyone into believing he would be best suited for the job. 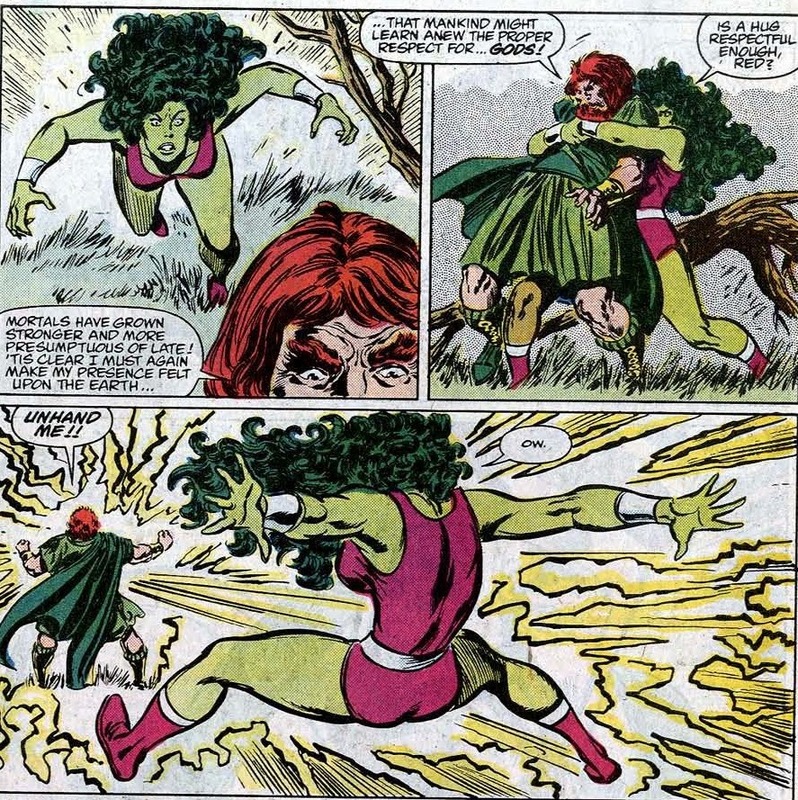 As another part of Simonson's ongoing storyline, Druid was subtly influenced by the mysterious transtemporal woman Nebula. No, not Thanos' alleged space pirate granddaughter, but an alternate reality Ravonna who donned the armor of her world's Kang the Conqueror to join the Council of Crosstime Kangs and... Ow, you know what, this is actually pretty dry and dense stuff. "You want to listen to me. Believe me, Jennifer, this is all for the best." 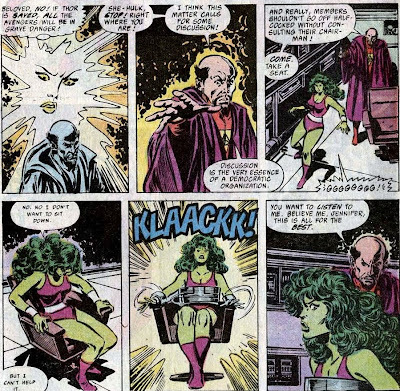 In order to ensure her continued cooperation, Nebula supplied Druid with mind benders, future tech that turned the She-Hulk into their willing accomplice. Jennifer happily assisted Druid and Nebula in 'recruiting' the remaining active Avengers Black Knight and Thor. Just to be on the safe side, even Edwin Jarvis got one, so he wouldn't secretly warn the West Coast Avengers. The Black Knight was saved by members of the Council of Cross-Time Kangs who had come after Nebula. They used their technology to disable the mind benders, causing Thor and She-Hulk to revert to their old selves within seconds. Needless to say, they weren't too pleased and wanted their pound of flesh... Only to find the still lovestruck Doctor Druid standing in their way, in a hilarious attempt at protecting his lady. "Never fear, my heart! The mind is the superior weapon!" "I've lost everything. Even my self respect. I wish I had killed her!" "She made me do horrible things! Things that were partly from inside my own soul." With that tearful goodbye, She-Hulk's second stint on the team reached a rather unceremonious ending. But all the torment and misery she suffered through would soon be forgotten after John Byrne took her under his wing once again. He lovingly launched Jennifer in her second ongoing title: The Sensational She-Hulk, which we'll cover in Jade Jaunting part V: Sensationally Shattering The Fourth Wall. I always thought Nebula was the Thanos one, thanks for clearing that up. Makes more sense. "The genuine affection I felt for this line up. While they were by no means the most powerful grouping ever assembled, they were a diverse, colorful bunch with a great power set"... exactly my feeling,one of my fave composition. This is the run which started me on 'Avengers' ... I remember my first ish was the battle with the Awesome Android. It was a really quality run, although the subject matter was often grim and Buscema and Palmer's dark artwork added to that atmosphere. 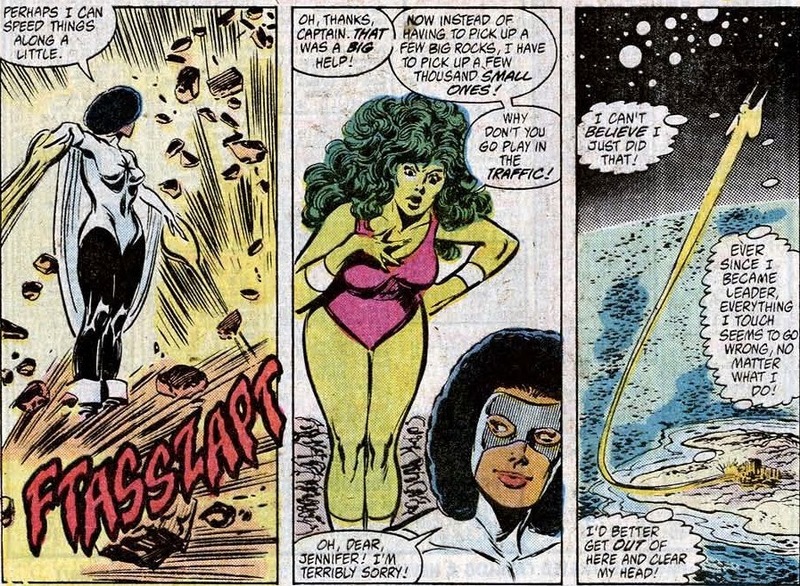 I'm not sure I'd agree Shulkie spent the run being embarrassed though. She got her win back against Dionysus and there's no shame in losing to Zeus or Tyrak - Zeus has beaten up Thor and just recently nearly pounded the Hulk to death without breathing hard. Tyrak has given Namor fits and provided a real challenge to a tough Avengers team which included Vision and Wonder Man ... Jen still scored the knockout blow over him even with CM's help. 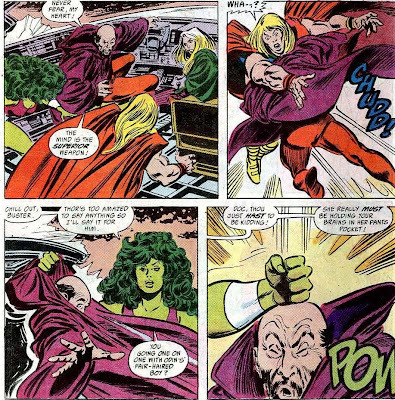 And you forgot to mention that, unbelievably, Jen beat Thor up TWICE in this run, although admittedly Thor was either taken by surprise or under Ravonna's control. Simonson must really have gone off Thor once he stepped off the big guy's title to write that. Still, that was Jen's biggest scalp to that date and in all honesty, I wouldn't fancy her chances against the Thunder God now.